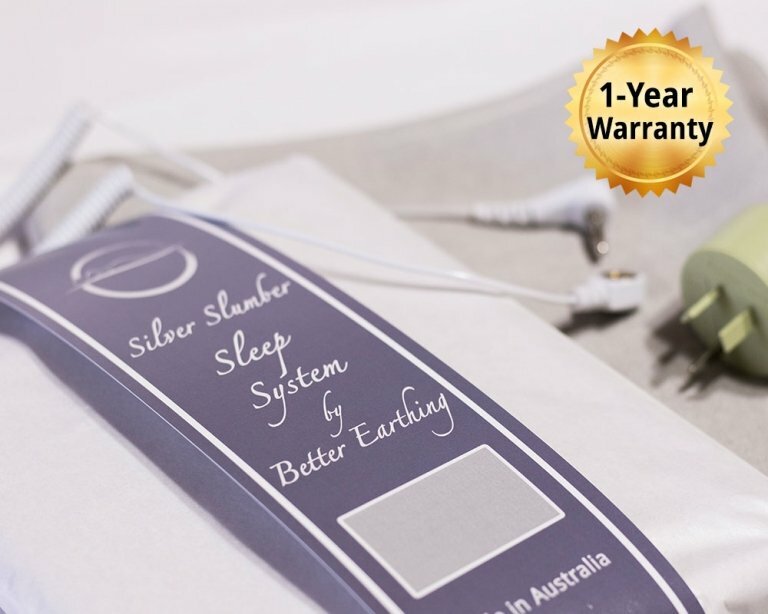 The Better Earthing pillow case is made in Australia with superior quality French silver coated fibre that is long-lasting and anti-microbial. This is the first earthing pillow case designed to be used inside your existing pillow case. When you sleep on an earthing pillowcase, you will likely experience deeper sleep and feel more refreshed on waking. Your facial blood flow may improve, making your skin may appear younger with less wrinkles, according to a report by the Earthing Institute. Size: Fits a standard pillow. Designed to be used inside your regular cotton pillow case. See product description below for fabric details and comparison with USA-made deep sleep silver pillowcase. 5% off when you buy 2 or more pillowcases (applied in the cart). The high percentage of pure silver in this earthing fabric means you do not need direct skin contact. When you rest your head on your pillow, your pillowcase fabric is compressed. 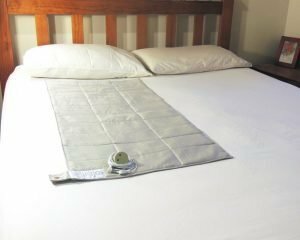 The tiniest bit of moisture in the fabric creates conductive channels that allow health-enhancing free electrons from the earth to pass from your earthing pillowcase to you. You can verify this with a multimeter or watch our video of a test here. Use with one (or two thin) regular cotton pillowcases (placed over the outside of your earthing pillowcase). This helps protect the silver fibres from normal body oil, hair oil, residue ingredients from face creams, men’s aftershave and other lotions which may damage the silver. Materials Made from is 50% Silver Coated Nylon and 50% pure Tencel (natural fibre). See earthing fabric explained. Marketed as “100% silver patented fabric” but it’s actually made from 50% silver plated nylon and 50% silver coloured polyester. Padding No Padding. Padding materials unknown. Use Place under your normal pillowcase. Place under your normal pillowcase. Quality Premium quality silver coated fibre from France that is treated with an antioxidant process to mitigate oxidisation damage. No details given. Size 50 x 73 cm. Conductive on both sides. 50.8 x 76.2 cm. Conductive on both sides. Better Earthing Pillowcases are washing machine friendly. Use a gentle detergent without bleach, whitening agents and ideally with no oils. We use Earth’s Choice blue laundry detergent (sold in most supermarkets). Sweat and body oils can build up on fabric through normal use, even with an underlay. This build-up can create a breeding ground for bacteria, mould or mildew. Anti-microbial fibre actively kills or inhibits the growth of bacteria, including those that cause odour. 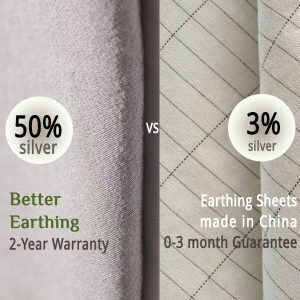 Better Earthing bedding uses pure silver coated fibre in 50% of the fabric. This reduces the need for washing, prolongs the life of the fabric and keeps replacement costs down. This premium earthing product comes with a 2-year warranty on its earthing effectiveness, plus a 1-year money-back satisfaction guarantee. Be careful when choosing an earthing product, as most other earthing product brands come with NO warranty on how long they will earth effectively for. A long time acne sufferer, after using the pillow case I have noticed a huge improvement to my skin. 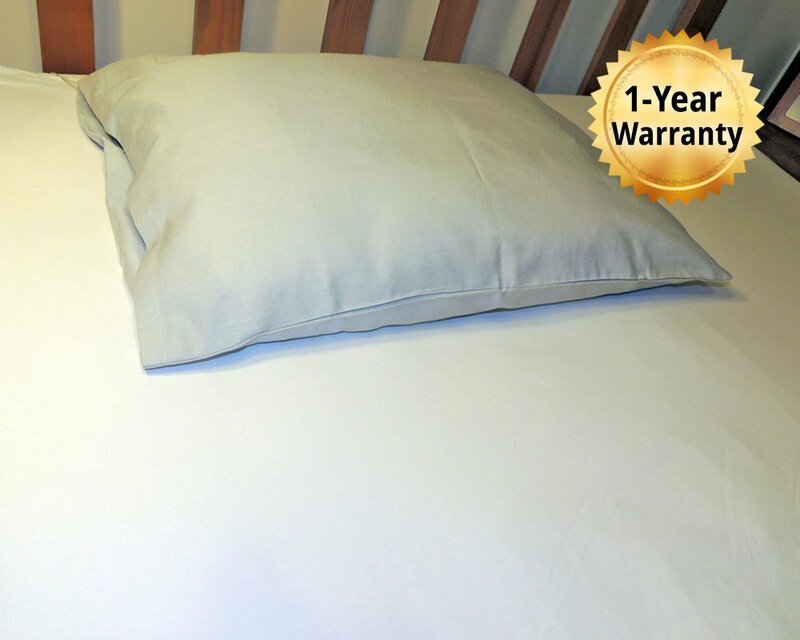 I have also suffered from upper backpain – this pillow has helped 90% with that! In addition, I notice the pillowcase makes me feel more rested, energised and calm. Cannot recommend this highly enough! I wish I could give 6 stars! After using the earthing products. 1. My mum has less pain (she is suffering from rheumatoid arthritis). She uses the pillow case & earthing mat. 2. I suffer from a rotator cuff injury. The earthing mat has reduced the pain to roughly 30-50%. 3. I am having better sleep and so is my mum. We now sleep for about 6 hours – 7 hours. I have noticed how my sleep has improved dramatically. I only wake up once during the night. And when I wake up in the mornings I feel refreshed.. My neck pain has also improved. I think it’s a great product that works well. I have been using the pillow case and so far i can tell you that i’ve been having a much deeper sleep and alot of dreams. 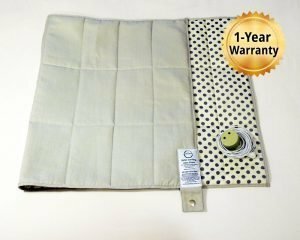 The Better Earthing pillow case my husband and I are using now is very good, it helps us to have a better sleeping quality & that’s why I highly recommend this product to my friends & relatives. You can tell from the many number of pillow cases that we bought. I’ve been finding my Earthing pillowcase wonderful. I sleep so well and deeply. 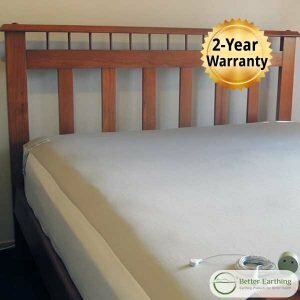 I’ve had lots of trouble with insomnia in the past and have been using Earthing products the last few years to help with that. I have NF2 so my nervous system is sometimes overwhelmed. I’ve had lots of brain surgery in the past. The silver pillowcase is wonderful for your nervous system and in particular the head and neck area. I receive lots of benefits and would highly recommend it for anyone. Thank you for providing such wonderful earthing products to the public. Also, I think your Australian made pillowcase is better than another one I’ve tried. It’s cheaper and I’m optimistic it will last longer. I’m delighted to have found it. I will definitely be back for more in future. I noticed my big toe joint is no longer giving me pain. Wonderful. 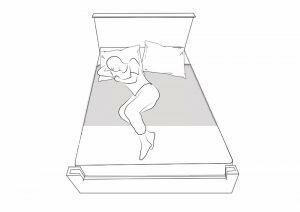 My neck pain reduced dramatically when I started sleeping on the earthing pillowcase. My neck used to be very stiff – beyond pain. I couldn’t turn my head. It was like that for 4 years. Now it’s 70% better. As a long term sufferer of cystic acne I have tried everything to help my skin from herbal to roaccutane. Within 5 nights I noticed a massive improvement to my skin, even scarring being less visible. Using the Better Earthing pillowcase has made a more dramatic difference than any applied cream or cleanser I have tried. I am relieved and impressed! 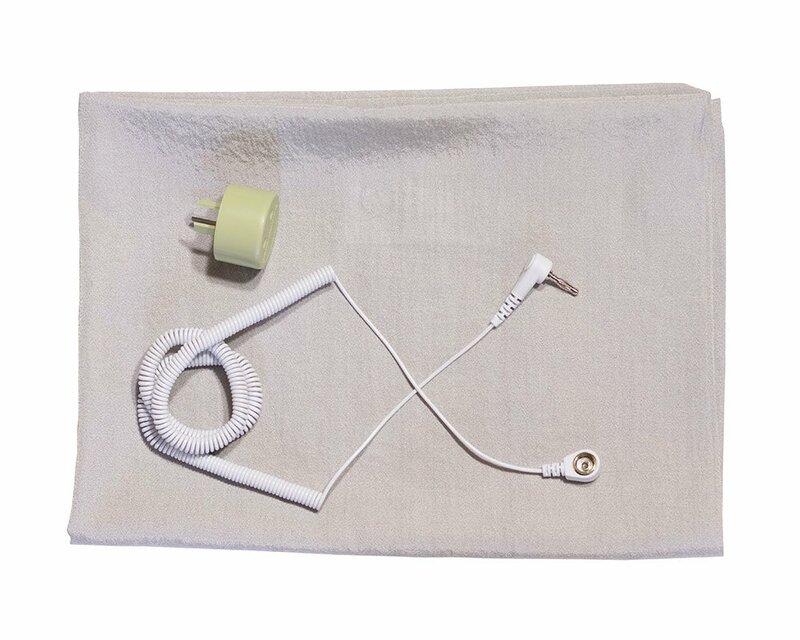 This Better Earthing Sleep System comes with a special adapter plug and lead designed for earthing indoors. All Australian and New Zealand powerpoints have a third ‘earth’ pin (at the bottom) that is wired to a metal rod or plate buried in the ground. This safety mechanism is called grounding – it’s there to send excess electricity back into the ground (earth). Indoor Earthing products use ground wiring in your home to safely pass free electrons from the earth to your indoor earthing product, then to you. No electricity is used. You can earth with the powerpoint turned off. The top two prongs of Better Earthing adapter are plastic, instead of metal like a normal plug, so no a/c current from your electricity mains can pass through. Both the Better Earthing Adapter and Lead have built-in safety resistors totalling 60,000 ohms. This protects against the rare (or theoretical) event of a power surge via the earth. If the nearby ground were struck with lighting, barely a mosquito bite of electricity could pass through these resistors. Better Earthing adapters conduct earth only. It is a safe and easy way to receive the earth’s health-enhancing free electrons from the comfort of your home. You can use an autorange multimeter (sold separately) to verify that your products are correctly Earthed via the powerpoint. Compare the amount of electrical voltage carried in your body when you are not earthed, compared to when you are earthed. You’ll be amazed by how much excess AC electricity your body can pick up from surrounding electrical cables and devices and how much it dissipates (reduces) when earthed.